Israeli forces continued to use excessive lethal force against Palestinian civilians, who participated in peaceful demonstrations organized on the 42nd anniversary of the Earth Day, particularly in the Gaza Strip, which witnessed peaceful demonstrations along the eastern Gaza Strip border area, where ten thousands of defenseless Palestinian young men, women, children, and elderlies participated. On Friday, 20 April 2018, the Gaza Strip witnessed peaceful demonstrations where ten thousands of Palestinian civilians participated. Those non-violent demonstrations continued sporadically during the reporting period. As a result, 4 Palestinian civilians, including a child, were killed, so the death toll has increased to 40 Palestinian civilians, including 5 children and 2 journalists, since the beginning of the demonstrations of the March of Return and Breaking the Siege on 30 March 2018 in the Gaza Strip only. Moreover, two civilians were killed after the Israeli forces claimed they threw explosive devices at a military patrol but their families confirmed they were only civilians. Further, a child was killed while attempting to sneak into Israel. In the Gaza Strip as well during the reporting period, 389 Palestinian civilians, including 67 children, 8 women, 6 journalists and 4 paramedics, were wounded; condition of some of them was reported serious. In the West Bank, the Israeli forces wounded 10 Palestinian civilians, including 1 child, 1 paramedic and 1journalist, in separate incidents. 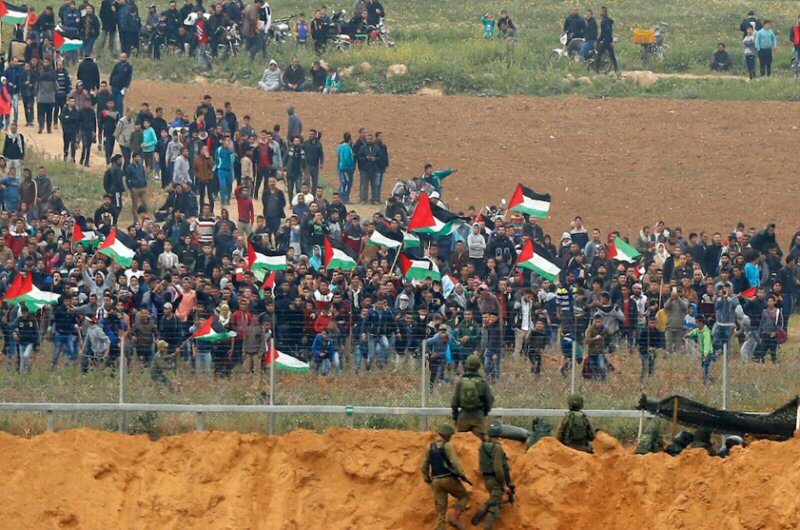 According to observations by PCHR’s fieldworkers, the Israeli forces stationed on huge sand barriers and hills and inside military vehicles, 30-50 meters away from the border fence continued deliberately firing live bullets and tear gas canisters at the protestors. PCHR’s fieldworkers noticed that the demonstrations were as always fully peaceful, and PCHR’s fieldworkers did not witness weapons or armed persons even dressed in civilian clothes among the demonstrators. The numbers of the demonstrators, reaching to thousands of men, elderlies, women and children within entire families of different ages, increased, reaching its peak at approximately 16:00 in the evening. They raised Palestinian flags, chanted slogans and national songs, flew kites and set fire to tires. 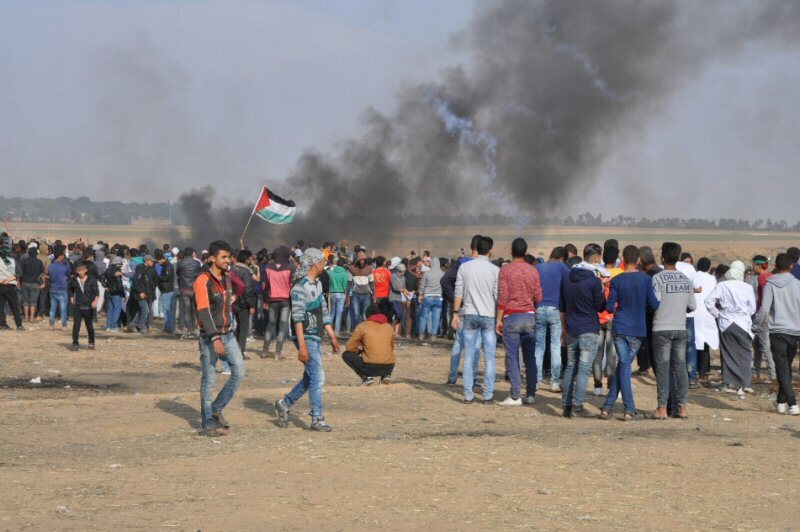 At approximately 17:00, under a huge Palestinian flag and amidst the sound of Scouts’ drums, hundreds approached at a close range from the border fence and the Israeli forces heavily targeted them with live fire and tear gas canisters. As a result, one of the civilians was killed while others were wounded. Moreover, dozens of women and civilians shouting national slogans were hit with tear gas canisters, noting they were standing on the sand barriers which are around 260 meters away from the border fence. The Israeli forces widely used bursts of tear gas canisters targeting the center of the demonstrations and the demonstrators near the border fence. The Ministry of Health moved the Field clinic from its previous location to a new one far away from the encampments after the Israeli forces targeted the mentioned clinic with tear gas canisters in the 2 previous Fridays. The Israeli shooting sporadically and deliberately continued until 20:00. As a result, Abdul Salam ‘Eid Zuhdi Baker (33) from Khan Yunis was killed after being hit with a live bullet that amputated part of his right hand finger and settled under the chest causing internal severe bleeding. Baker was taking photos of the incidents by his J7 cell phone while he was 100 meters away from the border fence, east of Khuza’ah. Moreover, 64 civilians, including 13 children, 2 women, a journalist and 3 volunteer paramedics, were wounded. Eighteen of them were hit with live bullets, 45 were directly hit with tear gas canisters and one civilian was hit with a rubber bullet. all the wounded were taken to the field clinics in the encampments and then transferred to Nasser, Gaza European and Algerian Hospitals in the city. Doctors classified their injury of 2 of them as serious. 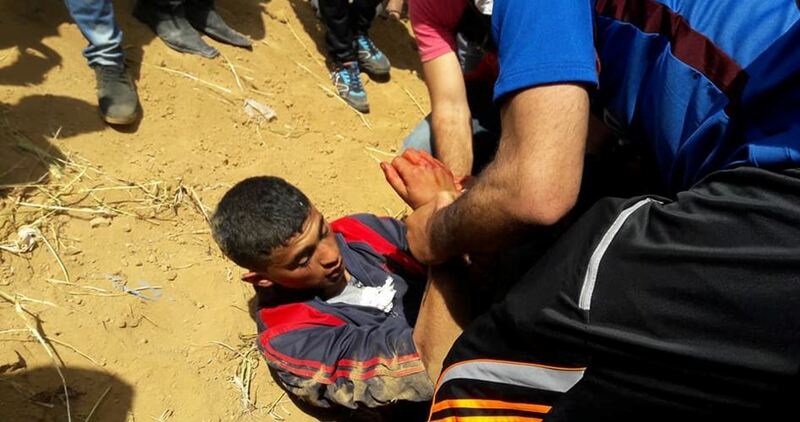 At approximately 04:30 on 28 April 2018, ‘Azzam Helal Riyad ‘Ouweidah (15) succumbed to wounds he sustained after being hit with a tear gas canister to the back of his head at approximately 18:10 on Friday while he was 100 meters away from the border fence, east of Khuza’ah. The tear gas canister caused a 2.5-centemeter hole in ‘Ouweidah’s head and brain laceration and fractures in the head bones. Moreover, Hundreds of civilians suffered tear gas inhalation and seizures as dozens of them were transferred to hospitals. Basic principles of using force and firearms do not apply, with regard to incidents which have occurred during the Great March of Return along Gaza’s border, with the army claiming that the marches constitutes a state of war. 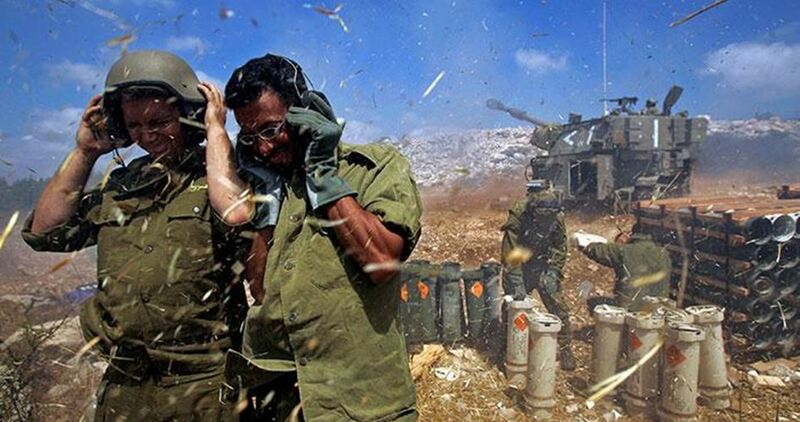 In response to a petition filed by human rights organizations against Israeli occupation forces’ orders to fire on peaceful demonstrators, the occupation claimed that the orders were consistent with Israeli law and international law. The standing goals behind the incidents that were mentioned, in the petitions, are not subject to the international human rights laws, nor to law enforcement rules under international human rights. The Israeli army claimed, according to Al Ray, that the Hamas movement exploits the marches in order to to carry out attacks against Israel. The army alleged that it does not consider participation in marches, nor approaching the fence, a hostile operation; instead, it considers each case separately. According to the Haaretz newspaper, the prosecution differentiates between law enforcement provisions related to demonstrations and cases of hostilities that include attempts to infiltrate Israel and carry out operations against soldiers and civilians. It explained that, in the first incident, the army resorts to lethal force as a last choice ,while lethal force is used firstly in the second case. Regarding shots fired, Israeli prosecution discussed the matter in closed sessions, in the presence of one party only, under the pretext of security classification, and other intelligence information. Amnesty International has called Thursday for a global arms embargo against Israel, accusing its forces of committing war crimes in the Gaza Strip. “Amnesty is renewing its calls for governments worldwide to impose a comprehensive arms embargo on Israel,” the group said in a fresh statement. The rights group has accused Israel of “carrying out a murderous assault” against Palestinians taking part on the “Great March of Return” in the Strip. On 30 March 2018, Palestinian youths launched a six-week campaign composed of a series of protests at the Gaza Strip, near the Gaza-Israel border. One of the main demands of the Great March of Return is that Palestinians be allowed to exercise their internationally recognised right to return to lands from which they and their families were expelled and from which Israel excludes them solely because they are not Jews. The Israelis overwhelmingly back the shooting of peaceful Palestinian protesters at Gaza border and the US President Donald Trump’s plans to relocate the US embassy from Tel Aviv to Occupied Jerusalem, a new poll found out. 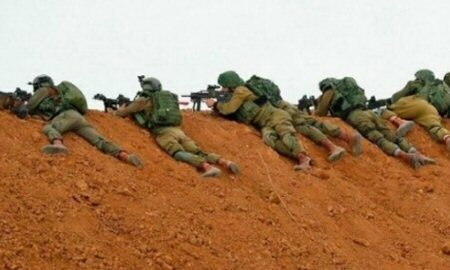 The poll, conducted by Tel Aviv University and the Israel Democracy Institute, shows that the majority of the Israelis strongly back the shooting attacks carried out by the occupation army against Palestinian protesters along Israel’s border with the blockaded Gaza Strip. Eighty-three percent of Israelis say they support the shooting policy. Since March 30th, 44 Palestinians were killed, among them 5 minors, and over 6,000 others have been left injuries in aggressive attacks by the Israeli military on the Great March of Return protests staged at Gaza’s border. According to the new survey, more than two-thirds of Israelis back Trump’s decision to move the embassy to Occupied Jerusalem. The poll shows that 63% of all Israelis say the embassy move benefits Israel. Following Trump’s December 6th declaration, rioting broke out across the Muslim world, with leaders of Muslim-majority nations condemning the decision. others – some with what appear to be deliberately inflicted life-changing injuries – during the weekly Friday protests that began on 30 March.